Klebsiella pneumoniae is a recognised agent of multidrug-resistant (MDR) healthcare-associated infections; however, individual strains vary in their virulence potential due to the presence of mobile accessory genes. In particular, gene clusters encoding the biosynthesis of siderophores aerobactin (iuc) and salmochelin (iro) are associated with invasive disease and are common amongst hypervirulent K. pneumoniae clones that cause severe community-associated infections such as liver abscess and pneumonia. Concerningly, iuc has also been reported in MDR strains in the hospital setting, where it was associated with increased mortality, highlighting the need to understand, detect and track the mobility of these virulence loci in the K. pneumoniae population. Here, we examined the genetic diversity, distribution and mobilisation of iuc and iro loci amongst 2503 K. pneumoniae genomes using comparative genomics approaches and developed tools for tracking them via genomic surveillance. Iro and iuc were detected at low prevalence (< 10%). Considerable genetic diversity was observed, resolving into five iro and six iuc lineages that show distinct patterns of mobilisation and dissemination in the K. pneumoniae population. The major burden of iuc and iro amongst the genomes analysed was due to two linked lineages (iuc1/iro1 74% and iuc2/iro2 14%), each carried by a distinct non-self-transmissible IncFIBK virulence plasmid type that we designate KpVP-1 and KpVP-2. These dominant types also carry hypermucoidy (rmpA) determinants and include all previously described virulence plasmids of K. pneumoniae. The other iuc and iro lineages were associated with diverse plasmids, including some carrying IncFII conjugative transfer regions and some imported from Escherichia coli; the exceptions were iro3 (mobilised by ICEKp1) and iuc4 (fixed in the chromosome of K. pneumoniae subspecies rhinoscleromatis). Iro/iuc mobile genetic elements (MGEs) appear to be stably maintained at high frequency within known hypervirulent strains (ST23, ST86, etc.) but were also detected at low prevalence in others such as MDR strain ST258. Iuc and iro are mobilised in K. pneumoniae via a limited number of MGEs. This study provides a framework for identifying and tracking these important virulence loci, which will be important for genomic surveillance efforts including monitoring for the emergence of hypervirulent MDR K. pneumoniae strains. The enteric opportunistic bacterial pathogen Klebsiella pneumoniae imposes an increasing infection burden worldwide [1, 2]. These infections typically fall into one of two distinct categories: healthcare-associated (HA) infections caused by strains that are frequently multidrug-resistant (MDR) and community-associated (CA) infections arising from the so-called hypervirulent strains that can cause highly invasive infections such as liver abscess but are usually drug sensitive [2, 3]. The antimicrobial resistance (AMR) and/or virulence determinants possessed by the associated bacteria are generally found on mobile genetic elements (MGEs) that transmit between K. pneumoniae cells via horizontal gene transfer (HGT) . These MGEs, most typically plasmids and integrative and conjugative elements (ICEs), are therefore important constituents of the accessory genome that imbue K. pneumoniae organisms with their distinct HA or CA clinical profiles. It is apparent that a wide diversity of K. pneumoniae can cause infections in hospitalised patients [3, 5, 6] and that basic pathogenicity factors such as lipopolysaccharide, capsular polysaccharide, type 3 fimbriae and the siderophore enterobactin (Ent) are common to all K. pneumoniae and conserved in the chromosome as core genes [1, 3]. However, enhanced virulence or ‘hypervirulence’ is associated with specific capsular serotypes (K1, K2, K5) and with MGE-encoded accessory genes that are much rarer in the K. pneumoniae population . Of particular importance are those encoding additional siderophore systems, namely yersiniabactin (Ybt) [3, 7, 8], aerobactin (Iuc)  and salmochelin (Iro) . Synthesis of acquired siderophores contributes to K. pneumoniae virulence via multiple mechanisms. However, iron assimilation via the conserved siderophore Ent is hampered by human neutrophils and epithelial cells through the secretion of lipocalin-2 (Lcn2), which binds, and thus inhibits bacterial uptake of, iron-loaded Ent . Ybt, Iro and Iuc on the other hand are not subject to Lcn2 binding; Iro is a glycosylated derivative of Ent, while Ybt and Iuc possess an entirely distinct structure from Ent. The ability of salmochelin to counter Lcn2 binding is important for bacterial growth and has been shown to correlate with enhanced virulence in a mouse sepsis model . The association between aerobactin and virulence has long been recognised, with multiple studies demonstrating its key role in an increased iron acquisition, bacterial growth and/or virulence in various murine models, human ascites fluid and blood [9, 13–15]. Even in strains that possess all four siderophore-encoding loci, Iuc appears to play the most critical role in virulence both in vitro and in vivo  and serves as an important biomarker for identifying hypervirulent isolates . In K. pneumoniae, Ybt biosynthesis is encoded by the ybt locus, which is typically located on a chromosomal ICE known as ICEKp (of which there are at least 14 distinct variants) and was recently also reported on plasmids [7, 8, 17]. A screen of 2500 K. pneumoniae genomes showed ybt to be prevalent in one third of the sequenced population and associated with hundreds of putative ICEKp acquisition events across the chromosomes of both hypervirulent and MDR lineages . In contrast, Iuc and Iro synthesis is encoded by loci (iuc and iro, depicted in Fig. 1), that are typically co-located on the so-called ‘virulence plasmids’ of K. pneumoniae. The best characterised virulence plasmids are the 224 kbp plasmid pK2044 from serotype K1, sequence type (ST) 23 strain NTUH-K2044 ; the 219 kbp plasmid pLVPK from K2, ST86 strain CG43 ; and the 121 kbp plasmid Kp52.145pII from serotype K2, ST66 strain Kp52.145 (strain also known as 52145 or B5055; plasmid also known as pKP100) [9, 20]. These plasmids also carry additional virulence determinants including rmpA genes that upregulate capsule production, conferring a hypermucoid phenotype that is considered a hallmark of hypervirulent strains , other gene clusters associated with iron uptake and utilisation and other loci encoding resistance to heavy metals such as copper (pco-pbr), silver (sil) and tellurite (ter) . In addition to the virulence plasmid-encoded iro and rmpA genes, the ST23 strain NTUH-K2044 also carries a chromosomal copy of iro and rmpA located within ICEKp1 ; however, this is not a typical feature of ST23 . The majority of K. pneumoniae lineages associated with liver abscess and other invasive community-acquired infections (e.g. clonal group (CG) 23, CG86, CG380) carry virulence plasmids encoding iro, iuc and rmpA [3, 9, 16, 23–25]. However, while virulence and AMR genes are both transmitted within the K. pneumoniae population via plasmids, until recently, these plasmids have mainly been segregated in non-overlapping populations such that the virulence plasmids encoding iuc and iro have rarely been detected in MDR populations that cause HA infections and outbreaks [3, 4, 26]. However, the virulence plasmid Kp52.145pII has been shown experimentally to be mobilisable , and there are emerging reports of MDR clones such as ST11, ST147 and ST15 acquiring virulence plasmids [27, 28]. The combination of hypervirulence and MDR can result in invasive infections that are very difficult to treat. This can result in dangerous hospital outbreaks; for example, an aerobactin-producing carbapenemase-producing ST11 strain recently caused a fatal outbreak of ventilator-associated pneumonia in a Chinese intensive care unit, with 100% mortality [27, 29]. AMR plasmids are also occasionally acquired by ST23 and other hypervirulent K. pneumoniae clones [25, 30, 31]. 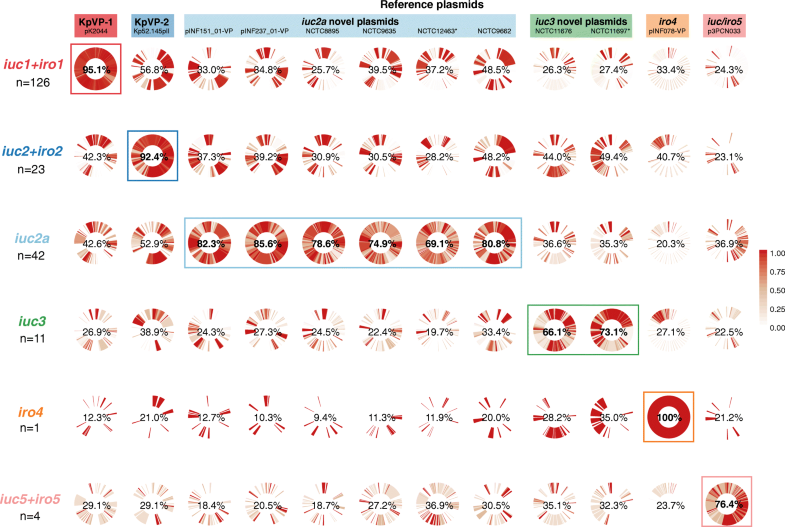 The ease with which virulence plasmids spread in the K. pneumoniae population poses a significant global health threat, highlighting the importance of understanding and monitoring the movement of these loci between different strains and clones. Here, we investigate the diversity of aerobactin and salmochelin synthesis loci in 2733 K. pneumoniae complex genomes, aiming to understand the diversity and distribution of these virulence loci in the population and to develop a framework for their inclusion in genomic surveillance efforts. 2733 genomes of the K. pneumoniae complex, including isolates collected from diverse sources and geographical locations, were analysed in this study (see Additional file 1). The genomes represent a convenience sample of our own isolate collections from clinical and species diversity studies [5, 8, 22, 32], as well as sequences that were publicly available in GenBank or via the NCTC 3000 project (https://www.sanger.ac.uk/resources/downloads/bacteria/nctc/) at the commencement of the study (June 2017). The majority of these genomes were also included in our previous genome study screening for yersiniabactin and colibactin . For n = 1847 genomes (see Additional file 1), Illumina short reads were available, and these were used to generate consistently optimised de novo assembly graphs using Unicycler v0.3.0b with SPAdes v3.8.1 [33, 34]. The remaining n = 886 genomes were publicly available only in the form of draft genome assemblies, i.e. with no reads available for direct analysis. All genome assemblies were re-annotated using Prokka  to allow for standardised comparison. All genomes were assigned to species by comparison to a curated set of Enterobacteriaceae genomes using mash (implemented in Kleborate, https://github.com/katholt/Kleborate); this confirmed 2503 K. pneumoniae, 12 Klebsiella quasipneumoniae subsp. quasipneumoniae, 59 K. quasipneumoniae subsp. similipneumoniae, 158 Klebsiella variicola and 1 Klebsiella quasivariicola (Additional file 1). Three isolates in our own collection (INF078, INF151, INF237) carried novel iuc and/or iro plasmids identified from short-read Illumina data. We subjected these to long-read sequencing using a MinION R9.4 flow cell (Oxford Nanopore Technologies (ONT)) device in order to resolve the complete sequences for the relevant plasmids. Overnight cultures of each isolate were prepared in LB broth at 37 °C, and DNA extracted using Agencourt Genfind v2 (Beckman Coulter) according to a previously described protocol (doi: https://doi.org/10.17504/protocols.io.p5mdq46). Sequencing libraries were prepared using a 1D ligation library (SQK-LSK108) and native barcoding (EXP-NBD103) as previously described [22, 36]. The resulting reads were combined with their respective Illumina reads to generate a hybrid assembly using our Unicycler software v0.4.4-beta [33, 36]. Note this approach uses ONT reads to bridge together contig sequences constructed from Illumina data, followed by consensus base call polishing with both types of reads. Annotations for the hybrid assemblies were generated as described above, and the annotated sequences submitted to GenBank under accession numbers QWFT01000001-QWFT01000009, and CP032831-CP032838 (Additional files 1, 2 and 3). Chromosomal sequence types were determined for each genome assembly using the BIGSdb-Kp seven-locus multi-locus sequence typing (MLST) scheme  screened using Kleborate (https://github.com/katholt/Kleborate). A novel ST (ST3370) was identified and added to the BIGSdb-Kp MLST database. To facilitate the development of MLST schemes for the aerobactin and salmochelin biosynthesis loci iuc and iro, alleles for genes belonging to each locus (i.e. iucABCD, iutA; and iroBCDN; respectively) from genomes with ‘typeable’ loci (defined as those in which all genes in the locus had high-quality consensus base calls when mapping with SRST2) were extracted by comparison to known alleles in the BIGSdb-Kp virulence database (http://bigsdb.pasteur.fr/klebsiella/klebsiella.html) , using SRST2 v0.2.0  to screen Illumina read sets where available and BLAST+ v2.2.30 to screen assemblies. Incomplete, ‘non-typeable’ iro and iuc loci were excluded from the MLST scheme (marked NT in Additional file 1). Each unique combination of alleles was assigned an aerobactin sequence type (AbST) or salmochelin sequence type (SmST), defined in Additional files 4 and 5. The AbST and SmST schemes, profiles and corresponding alleles are also available in the BIGSdb-Kp database and in the Kleborate Github repository (see links above). Capsule (K) loci were identified in each assembled genome using Kaptive . RmpA gene copy number was determined by BLASTn search of all genome assemblies using the rmpA and rmpA2 sequences from pK2044 (GenBank accession AP006726.1) as queries with > 90% coverage and > 90% nucleotide identity. Similarly, BLASTn was used to screen the genome assemblies for the IncFIBK repA sequence from virulence plasmids pK2044 and Kp52.145 pII (GenBank accession FO834905.1), with IncFIBK presence defined as > 90% coverage and > 80% nucleotide identity to these query sequences (to ensure inclusion of known IncFIBK sequences while excluding detection of non-FIBK sequences such as the IncFIB sequences frequently detected in other Enterobacteriaceae bacteria). IncFII replicons were identified using BLASTn search of the PlasmidFinder database . Assemblies of all iuc+ or iro+ genomes were manually inspected to determine whether the loci of interest were located on the chromosome or on previously described virulence plasmids (pK2044 and Kp52.145pII). This confirmed most to be located in the chromosome (iro3 in ICEKp1 or iuc4 in the subspecies rhinoscleromatis lineage) or one of the known plasmids. For the remaining genomes, annotated contigs containing the iuc and/or iro loci were checked for known chromosomal or plasmid features, aided by BLASTn searching against the NCBI non-redundant nucleotide database and inspection of the assembly graphs using Bandage v0.8.0 . Maximum likelihood phylogenetic trees capturing the relationships between AbSTs or SmSTs were constructed by aligning the allele nucleotide sequences corresponding to each sequence type within each scheme using MUSCLE v3.8.31  then using each of the two alignments (one for AbSTs, one for SmSTs) as input for phylogenetic inference in RAxML v7.7.2 . For each alignment, RAxML was run five times with the generalised time-reversible model and a gamma distribution, and the trees with the highest likelihood were selected. Lineages were defined as monophyletic groups of AbSTs or SmSTs, which were each associated with a unique MGE structure; STs within lineages shared ≥ 2 alleles (for SmSTs) or ≥ 3 alleles (for AbST), whereas no alleles were shared between lineages. Maximum likelihood phylogenies were similarly constructed for (i) aerobactin and salmochelin locus alignments populated by sequences extracted from BLAST hits amongst representatives of the wider Enterobacterales order (representatives listed in Additional file 6) and (ii) IncFIBK replicon sequence alignments constructed by mapping iuc-positive (iuc+) and iro-positive (iro+) genomes to a reference IncFIBK sequence (coordinates 128130 to 132007, spanning repA to sopB, of the pK2044 plasmid sequence; GenBank accession AP006726.1). Twelve representative plasmids (10 complete, including n = 3 generated from hybrid long- and short-read assemblies detailed above, and 2 partial) were chosen for comparative analysis (these are available as a set in FigShare under doi: https://doi.org/10.6084/m9.figshare.6839981; and see Additional file 2 for list of sources and GenBank accession numbers). Six of these representative plasmids were sourced from the NCTC 3000 project (https://www.sanger.ac.uk/resources/downloads/bacteria/nctc/). As no complete plasmid sequences from K. pneumoniae were available with iuc5, we used plasmid p3PCN033 from E. coli as the reference for iuc5. We consider this appropriate in the circumstances since the K. pneumoniae iuc5 plasmids shared with p3PCN033 the IncFII replicon (native to E. coli) and the iuc and iro sequences and structural variants typical of E. coli; the iuc5 contigs from K. pneumoniae showed 99.19–99.95% sequence identity with p3PCN033, and IncFII plasmids while considered native to E. coli have been detected in Klebsiella pneumoniae alongside other Enterobacteriaceae members [44, 45]. The representative plasmid sequences were compared using Mauve v2.4.0 , in order to identify homology blocks conserved amongst subsets of the plasmids. BLASTn comparisons of related plasmids were plotted using GenoPlotR v0.8.7 package  for R. All iuc+ or iro+ genomes were mapped against all 12 representative plasmids in order to calculate the coverage of each plasmid in each genome. This was done using Bowtie2 v2.2.9  to map Illumina reads where available, and 100 bp reads simulated from draft assemblies where raw sequence reads were not available, using the RedDog pipeline (https://github.com/katholt/RedDog). For every gene annotated within each reference plasmid, the proportion of isolates within each group of genomes sharing the same iuc/iro lineage carrying the gene was calculated using the gene presence/absence table reported by RedDog (presence defined as ≥ 95% of the length of the gene being covered by at least five reads) and plotted as circular heatmaps using ggplot2 in R (using geom_tile to achieve a heatmap grid and polar_coord to circularise). Iuc and iro were detected only in K. pneumoniae genomes, and not in other members of the K. pneumoniae species complex. Of the 2503 K. pneumoniae genomes screened, iuc was detected in 8.7% (n = 217) and iro in 7.2% (n = 181; listed in Additional file 1, excluding those with a partial iro locus as discussed below). The presence of intact iro and iuc loci was strongly associated (odds ratio (OR) 711, 95% confidence interval (CI) 386–1458, p < 1 × 10−16), co-occurring in 162 genomes (6.5% of the genomes tested). The iro locus appears to be susceptible to deletion; partial iro loci were observed in n = 50 K. pneumoniae isolates (noted as iro* in Additional file 1), mostly those that were isolated from historical collections prior to 1960. Of 39 isolates collected prior to 1960 and with any iro genes present, 36 (92%) carried deletion variants of the locus, compared to 4/163 (2.5%) amongst isolates from 1975 onwards (OR 416, 95% CI 88–3297, p < 2 × 10−16). As expected, the presence of iuc and iro was each strongly associated with the presence of rmpA, with 157 genomes carrying all three loci (excluding partial iro). A total of 238 genomes (9.5%) carried rmpA genes: n = 110 (4.4%) carried one, n = 127 (5.1%) carried two, and a single genome, ST23 NTUH-K2044, carried three (as described previously [7, 18], see Additional file 1). Next, we explored nucleotide diversity of the genes comprising the iro and iuc loci in K. pneumoniae. The five genes comprising the iuc locus (Fig. 1a) and four genes of the K. pneumoniae forms of the iro locus (Fig. 1b) were screened for sequence variation, and each unique gene sequence variant was assigned an allele number. Of the n = 209 genomes carrying a typeable iuc locus, 62 unique iuc allele combinations were observed and assigned a unique aerobactin sequence type or AbST (see Additional file 4 for AbST definitions and Additional file 1 for AbSTs assigned to each genome). The iutA alleles present in the iuc locus showed > 28% nucleotide divergence from a core chromosomal paralog of iutA encoding a TonB-dependent siderophore receptor (positions 2043670–2045871 in NTUH-K2044), which we observed in 96.4% of all genomes; the alleles of this core chromosomal gene are not included in the aerobactin MLST scheme. Typeable iro loci were identified in n = 164 genomes, comprising 35 unique salmochelin sequence types or SmSTs (defined in Additional file 5, see Additional file 1 for SmSTs assigned to each genome). Maximum likelihood phylogenetic analyses of the AbST and SmST sequences, and their translated amino acid sequences, revealed five highly distinct iuc lineages and five iro lineages (labelled iro1, iro2 etc. ; see Fig. 1c, Additional file 7). Nucleotide divergence between lineages was 1–11% (20–1000 substitutions), and no alleles were shared between lineages (Additional files 8 and 9). Nucleotide divergence within lineages was low, with mean divergence of 0.001–0.40% (iro) and 0.013–0.50% (iuc) (Additional files 8 and 9) and at least two (iro) or three (iuc) shared alleles between members of the same lineage. Of note, the iro4, iro5 and iuc5 loci were quite distant from other lineages (each showing > 5.5% nucleotide divergence from all other lineages vs < 4.6% divergence amongst the other lineages; Fig. 1, Additional files 8 and 9). Comparison to iuc and iro genes present in other bacteria (all of which were members of the order Enterobacterales, see Additional files 10 and 11), and the presence of the additional iroE gene that we observed in other bacteria (all of which were members of family Enterobacteriaceae, see Fig. 1b), suggests that these more distant lineages derive from outside Klebsiella, most likely Enterobacter (iro4) and E. coli (iro5, iuc5). Note that genotyping of rmpA was not performed since most rmpA-positive genomes carry two copies of the gene, which complicates allele typing from short-read data; however, rmpA copy number per genome is reported in Additional file 1. Inspection of the genetic context surrounding the iuc and iro sequences revealed that the various iuc and iro lineages were associated with distinct MGEs, with the exception of iuc4 which was restricted to the chromosome of K. pneumoniae subspecies rhinoscleromatis (ST67) (Fig. 1c, Table 1). Most common were iuc1 and iro1; these were both associated with pK2044-like plasmids (hereafter called KpVP1-1, see below) and the presence of two rmpA genes and accounted for 74% of all iuc+iro+ genomes. These were followed by iuc2 and iro2, which were associated with Kp52.145 pII-like plasmids (hereafter called KpVP-2, see below), the presence of one rmpA gene, and accounted for 14% of all iuc+iro+ genomes. A sister clade of iuc2, which we named iuc2a, was associated with diverse plasmids that shared some homology with Kp52.145 pII (36–70% coverage, 99% nucleotide identity). Most iuc2a+ isolates carried a single rmpA gene (n = 38, 88.4%), and all lacked an intact iro locus (n = 26, 60.5% had a partial iro locus). Lineage iuc3 was related to the iuc4 lineage encoded on the rhinoscleromatis chromosome but was present on novel plasmids. Iro3 was located within the chromosomally integrated ICEKp1, along with rmpA. Four genomes carried iuc5 (two of these also carried iro5; all lacked rmpA). The iuc5 sequences were distantly related to iuc1 and iuc2 (> 8.9% nucleotide divergence) but were identical to sequences found in E. coli and located on contigs that matched closely to E. coli AMR plasmids (e.g. strain PCN033 plasmid p3PCN033, accession CP006635.1 , which showed > 99% nucleotide identity to the best assembled of iuc5+ K. pneumoniae contigs). Iro4 was identified in a single genome (which lacked rmpA) and was > 6.1% divergent from iro1 and iro2 sequences. Its closest known relatives are iro sequences present in the chromosomes of Enterobacter cloacae and Enterobacter hormaechei (strains AR_0065, accession CP020053.1, and 34977, accession CP010376.2, respectively; 95% identity). Lineages iro4 and iro5 follow the gene configuration typical of non-K. pneumoniae Enterobacteriaceae iro loci, from which the K. pneumoniae iro1, iro2 and iro3 differ by lack of iroE and inversion of iroN (see Fig. 1b). To examine the gene content and replicon differences between the various K. pneumoniae plasmids associated with iuc and/or iro, 12 representative plasmids associated with the various lineages were selected for comparison (Fig. 2, Additional file 2). These include six complete K. pneumoniae plasmid sequences identified from finished genomes: iuc1/iro1 (n = 1), iuc2/iro2 (n = 1), iuc2a (n = 3), iuc3 (n = 1); three novel complete K. pneumoniae plasmid sequences that we generated for this study, carrying iuc2a (n = 2) and iro4 (n = 1); and two large contigs that we identified from public K. pneumoniae genome data representing partial sequences for additional plasmids carrying iuc2a (n = 1) and iuc3 (n = 1) (Fig. 2). The K. pneumoniae genomes in which iuc5/iro5 were identified were available only as draft assemblies deposited in public databases, and the associated plasmid sequences were fragmented in these assemblies; hence, we used E. coli strain PCN033 plasmid p3PCN033  as the representative for iuc5/iro5. The representative plasmid sequences differed substantially in their structure and gene content between and within the different lineages (Fig. 2b, c). All representative iuc or iro plasmids harboured an IncFIBK (n = 9) or IncFIB (n = 3) replicon, including the repA replication gene, oriT origin of transfer and sopAB partitioning genes (presence of these replicons in each plasmid is indicated purple in Fig. 2c and listed in Additional file 2). The IncFIBK replicon was present in n = 202/208 (97%) of isolates with plasmid-encoded iuc or iro, including 100% of iuc1/iro1, iuc2/iro2, iuc2a and iro4 isolates, and 82% of iuc3 isolates. Each of these iuc/iro lineages was associated with a unique sequence variant of the IncFIBK replicon (see tree in Fig. 3 and nucleotide identity with the IncFIBK rep sequences from KpVP-1 and KpVP-2 listed in Additional file 1), supporting the segregation of the iuc and iro loci with distinct FIBK plasmid backbones. However, the IncFIBK replicon was also widely detected amongst isolates that do not carry iro and iuc (77% of all K. pneumoniae genomes and 69% amongst other species in the complex; see Additional file 1), including MDR K. pneumoniae lineages such as CG258, and is known to be associated with AMR plasmids [44, 50]. IncFIB replicons, which are common amongst E. coli and display > 39% nucleotide divergence from the IncFIBK replicon, were found in all K. pneumoniae isolates carrying the E. coli variant iuc5 (100%) and also detected in two isolates carrying iuc3 plasmids (18%; marked in Fig. 2a, c), suggesting the transfer of these iuc variants into K. pneumoniae via such plasmids. In order to explore structural conservation of plasmids amongst isolates with each iro or iuc lineage, we mapped the sequence data from all isolates carrying either of these loci against the 12 representative plasmid sequences (Fig. 4). This revealed that plasmid structures were largely conserved amongst isolates sharing the same iuc or iro lineages, although plasmids associated with iuc2a and iuc3 showed more diversity than others (Fig. 4 and see below). The distribution of iuc and iro variants with respect to the clonal group of the host strain, identified by chromosomal MLST, shows that each follows quite distinct patterns of dissemination in the K. pneumoniae population (Fig. 5). Iuc/iro lineages 1 and 2 accounted for 64% of K. pneumoniae isolates carrying any aerobactin or salmochelin synthesis loci, and 88% of isolates carrying both. While it was not possible to resolve the complete sequences for all plasmids associated with these lineages, read mapping to pK2044 and Kp52.145 pII reference sequences strongly supported the presence of pK2044-like plasmids in iro1+iuc1+ genomes (mean plasmid coverage of 95.1%, range 28.8–100%; see Fig. 4) and Kp52.145 pII-like plasmids in iro2+iuc2+ genomes (mean plasmid coverage of 92.4%, range 87.2–100%; see Fig. 4). There were limited homologous regions shared between the two plasmids (Fig. 2), including the iro, iuc, rmpA and fec loci, and the IncFIBK replicon (Additional file 12). These shared regions were largely conserved across all isolates carrying iuc/iro lineages 1 or 2; the remaining regions unique to either pK2044 or Kp52.145 pII were largely conserved amongst the isolates that carried lineage 1 or 2 loci, respectively (Fig. 4). Notably, the loci encoding heavy metal resistances against copper (pbr-pco), silver (sil) and tellurite (terXYW and terZABCDEF) were highly conserved amongst lineage 1 isolates but not present in any of the lineage 2 isolates (Additional file 12). As noted above, iuc/iro lineages 1 and 2 were also each associated with a distinct variant of the IncFIBK replicon sequence (Fig. 3). Hence, we define pK2044-like plasmids carrying iuc1 and iro1 loci as K. pneumoniae virulence plasmid type 1 (KpVP-1), with reference plasmid pK2044, and Kp52.145 pII-like plasmids carrying iuc2 and iro2 loci as K. pneumoniae virulence plasmid type 2 (KpVP-2). Both plasmid types typically carry at least one copy of rmpA; neither one carries genes associated with conjugation; hence, we assume they are not self-transmissible. KpVP-1 and KpVP-2 showed distinct distributions within the K. pneumoniae population. KpVP-1 was present in 5.0% of all isolates and accounted for 74% of iuc+iro+ isolates. The KpVP-1 reference plasmid pK2044 originated from an ST23 isolate (CG23), and KpVP-1 was strongly associated with this and two other well-known hypervirulent clones CG65 and CG86, in which it was present at high prevalence (ranging from 79.0 to 96.4%, see Fig. 5). KpVP-1 was also detected at low frequencies in other clones, including CG34, CG111, CG113 and CG25, suggesting it is mobile within the K. pneumoniae population (Fig. 5). KpVP-2 was present in 0.96% of all isolates and accounted for 14% of iuc+iro+ isolates. The KpVP-2 reference plasmid Kp52.145 pII originated from an ST66 isolate, and KpVP-2 was present in all isolates of the associated clonal group CG66 (n = 11) and also all isolates of CG380 (n = 12) (Fig. 5). 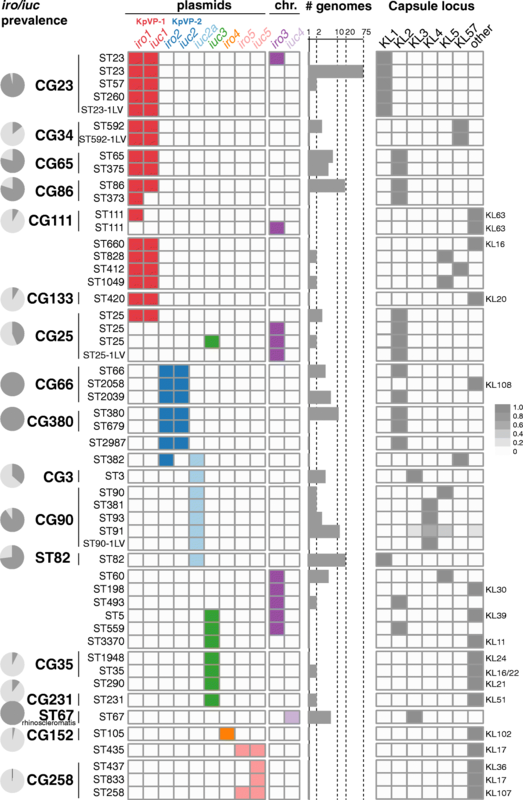 Iuc2a was identified in 43 isolates largely belonging to three clonal groups (ST3, n = 4; CG90, n = 19; ST82, n = 19; ST382, n = 1; see Fig. 5), with the majority (n = 38, 88.4%) from the historical NCTC or Murray collections and isolated between 1932 and 1960 (Additional file 1). One of these isolates also carried iro2 in addition to iuc2a, which in all other instances was only observed with iuc2 on KpVP-2. Provenance information was available for only 12 of the iuc2a+ isolates (1 ST3, 9 CG90, 2 ST82); all of which originated from the human respiratory tract (3 nose, 1 throat, 7 sputum and 2 NCTC isolates recorded only as a respiratory tract). We used long-read sequencing to resolve plasmids in two novel iuc2a+ isolates from our own collection, INF151and INF237, which were both CG90 Australian hospital sputum isolates (summarised in Additional file 3). This yielded IncFIBK plasmids in each genome, of size 138.1 kbp and 133.7 kbp, respectively (accessions: pINF151_01-VP, QWFT01000004; pINF237_01-VP, CP032834). Both plasmids carried iuc2a and one rmpA gene, but they differed slightly from one another in structure and gene content and differed substantially from the three complete iuc2a+ plasmid sequences available from NCTC isolates (ST3 and CG90; see Figs. 2 and 4). Only one of these plasmids (from NCTC 12463; incomplete) carried a conjugative transfer region (IncFII); hence, we predict most are not self-transmissible. Mapping of iuc2a+ genomes to each of the five representative iuc2a+ plasmid sequences indicated a degree of conservation between plasmids in isolates belonging to the same K. pneumoniae clone, but none particularly well conserved across all iuc2a+ isolates (Fig. 4, Additional file 13). However, all iuc2a+ isolates formed a tight monophyletic cluster in the IncFIBK replicon tree (Fig. 3), consistent with recent shared plasmid ancestry followed by frequent structural and gene content changes. Notably, the iuc2a-associated IncFIBK replicon sequences were closely related to those of KpVP-1 and distant from those of KpVP-2; hence, we hypothesise that iuc2a plasmids share an ancestor that was a mosaic including iuc2-related sequences from KpVP-2 and IncFIBK replicon sequences from KpVP-1. Lineage iuc3 was detected in 11 isolates from diverse sources and chromosomal STs (Fig. 5) and was associated with three related variants of the IncFIBK replicon (Fig. 3). We identified one complete and one near-complete iuc3 plasmid sequences: a complete 189.8 kb plasmid from NCTC 11676 (isolated 1979, ST290) and a 155.4 kb contig from NCTC 11697 (isolated 1984, ST3370) (Fig. 2). The plasmids share around half of their gene content (96 kbp), including the IncFIIK tra-trb conjugative transfer machinery, a fimbrial protein and the fec iron acquisition system in addition to iuc3 (Figs. 2 and 4, Additional file 2). Mapping to these sequences showed all iuc3+ isolates carried related plasmids with an IncFIIK tra-trb transfer region (Fig. 4, Additional file 12). Lineage iro4 was identified in a single hospital UTI isolate INF078 (ST105) from Australia, whose genome sequence we completed using long reads (replicons summarised in Additional file 3). Hybrid assembly using short and long reads resolved a 399,913 kbp plasmid, pINF078-VP (accession CP032832) which carried multiple copies of iro4, the IncFIBK replicon (similar to the KpVP-2 variant, see Fig. 5) and the IncFIIK replicon and tra-trb transfer region (Fig. 2). As noted above, the iro4 locus is more closely related to Enterobacter iro than to other K. pneumoniae iro in terms of both structure (including the iroE gene; see Fig. 1b, Additional file 14) and sequence (Additional file 10), suggesting it has been transferred from Enterobacter into a K. pneumoniae IncFIBK/FIIK plasmid backbone. pINF078-VP harboured multiple tandem copies of a 17,129 bp region containing iroBCDEN and 12 other genes of unknown function (Additional file 14). Long-read sequences (up to 70 kbp) spanning the non-repeat and repeat region of pINF078-VP confirmed at least n = 3 copies of the 17 kbp repeated sequence, whose mean read depth in the Illumina sequence data was 13.3 times that of the rest of the plasmid sequence, suggesting approximately 13 tandem copies. Four K. pneumoniae isolates carried the E. coli variant iuc5; two of these also carried the E. coli variant iro5 (see species trees in Additional file 10). Three iuc5+ isolates (including one with iro5) belonged to the globally disseminated, carbapenemase-producing K. pneumoniae CG258 (ST258, KPC+; ST437, KPC+; ST833, KPC−) and carried several AMR genes. Unfortunately, all four iuc5+ genomes were sourced from public databases and were available in draft form only, and the complete plasmid sequences could not be resolved. However, the iuc5+ contig sequences from K. pneumoniae share close homology with iuc5+iro5+ IncFII conjugative plasmids from E. coli that also carry AMR genes (e.g. p3PCN033, CP006635.1; D3 plasmid A, CP010141.1). Notably, all iuc5 contigs from K. pneumoniae shared > 75% coverage and 98.19–99.95% identity to the p3PCN033 reference plasmid. 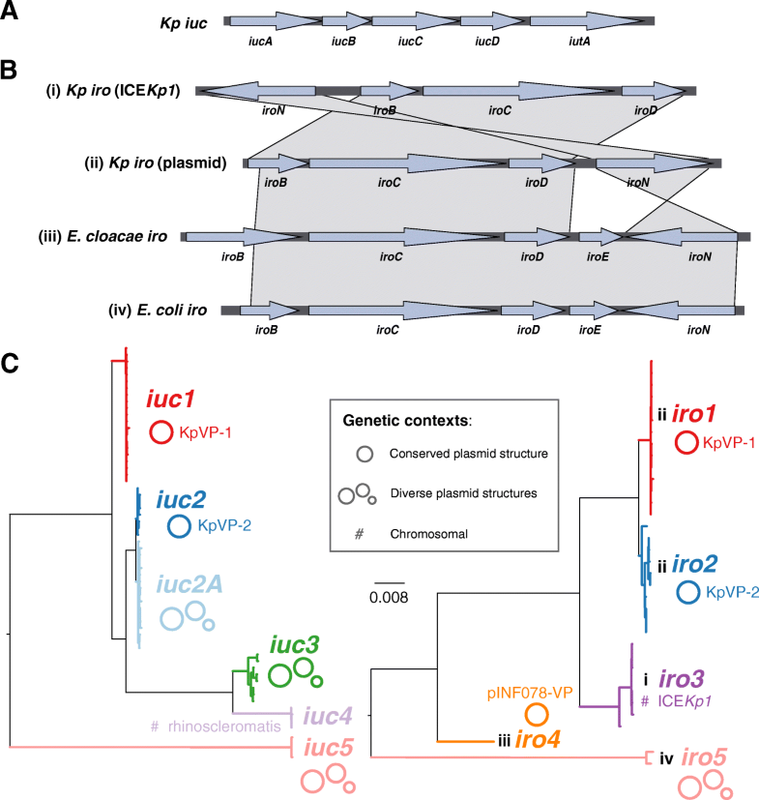 This study reveals significant genetic diversity underlying the biosynthesis of aerobactin and salmochelin in K. pneumoniae but shows the distribution of iuc and iro locus variants is highly structured within the population. Our data indicate that most of the burden of these hypervirulence-associated siderophores in the K. pneumoniae population is associated with two dominant virulence plasmids, which we define here as KpVP-1 and KpVP-2, that differ in terms of gene content (Fig. 2) and are each associated with co-segregating sequences of the non-self-transmissible IncFIBK replicon, iuc and iro loci (Figs. 1 and 3). 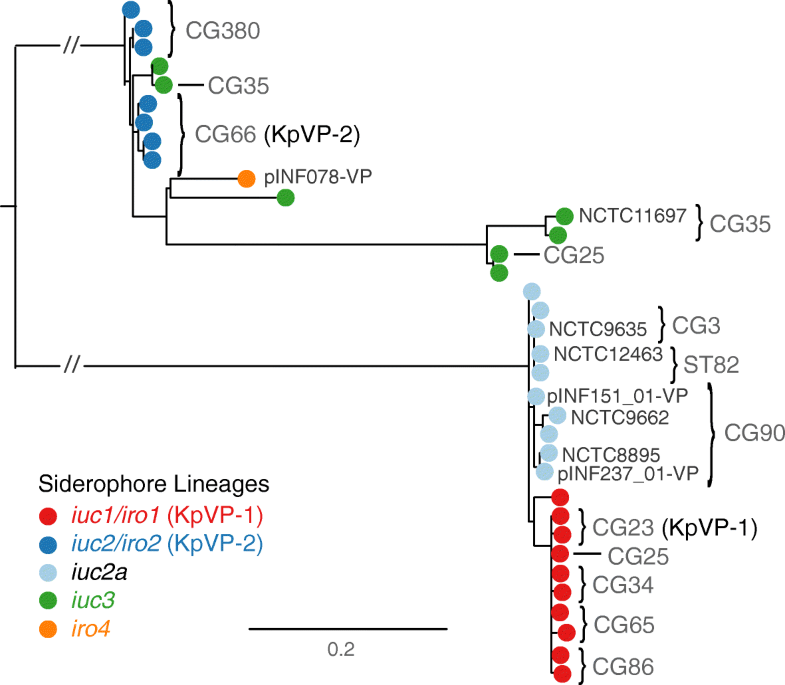 These dominant virulence plasmid types are each represented by one of the previously characterised K. pneumoniae virulence plasmids [18, 20], pK2044 (KpVP-1, encoding iro1 and iuc1) and Kp152.145pII (KpVP-2, encoding iro2 and iuc2); both also carry hypermucoidy determinants, and together, they account for 74% and 14% of the iuc+iro+ K. pneumoniae genomes analysed. Importantly, our data indicate that each of these common virulence plasmid variants is maintained at high prevalence in a small number of known hypervirulent clones: KpVP-1 in CG23 (96%, including pK2044 ), CG86 (80%, including pLVPK ) and CG65 (79%); KpVP-2 in CG66 (100%, including Kp152.145pII) and CG380 (100%) (Fig. 5). This suggests that both plasmid types can persist for long periods within a host bacterial lineage as it undergoes clonal expansion; indeed, our recent study of the evolutionary history of CG23 indicates that KpVP-1 has been maintained in this clonally expanding lineage for at least a century . The lack of conjugation machinery is likely an important variable contributing to clonal expansion being the primary mode of dispersal over horizontal gene trasfer, although notably, we also detected KpVP-1 at low prevalence in numerous other K. pneumoniae lineages and KpVP-2 at low prevalence in one other lineage, suggesting the possibility of wider dissemination of both plasmid types by occasional transfer to new lineages (Fig. 5). Given the stability of the plasmids observed in several clonal groups, we speculate that some of these transfer events will result in the emergence of novel hypervirulent strains that can stably maintain the plasmid into the future. In contrast, the non-plasmid form of iro (iro3, occasionally integrated into the chromosomes of K. pneumoniae via ICEKp1) was found at low prevalence (< 0.5%) and included just 1 of the 79 ST23 isolates analysed (NTUH-K2044, in which ICEKp1 was first described), 1/1 ST5, 1/21 ST111 (13%), 1/2 ST198, 2/15 CG25, 2/2 ST493 and 5/5 ST60. Hence, while ICEKp1 is somewhat dispersed in the K. pneumoniae population, it shows little evidence of stability within lineages, consistent with our previous observations regarding ICEKp in general . We also detected several novel iuc+ or iro+ plasmid types, the most common being the group of iuc2a plasmids (21% of all iuc+ isolates) that were detected in respiratory isolates from CG3, CG82 and CG90 and mostly originated from historical collections . Interestingly, these combine an iuc sequence closely related to that of KpVP-2 (Fig. 1) with an IncFIBK replicon sequence very close to that of KpVP-1 (Fig. 3) and showed substantial mosaicism and gene content variation (Figs. 2 and 4). The iuc3 lineage was also quite common amongst the novel plasmid types (5.3% of all iuc+ isolates) and associated with a variety of diverse plasmids, most of which carried the IncFII tra-trb conjugative transfer region and thus are likely self-transmissible (Figs. 2 and 4). It is notable that iuc2a and iuc3 plasmids were not only relatively rare in the bacterial population but also showed less evidence of stable maintenance within K. pneumoniae lineages (Fig. 5) and lower stability of gene content (Fig. 2) than the dominant KpVP-1 and KpVP-2 plasmids (Fig. 4). The position of iuc2a and iuc3 in the iuc trees (Fig. 1, Additional file 10) suggests that both are derive from other K. pneumoniae loci; hence, we speculate it is the properties of the plasmids mobilising these loci, and not the siderophore biosynthesis loci themselves, that makes these variants less widespread in the K. pneumoniae population. This variation in gene content may be a consequence of self-transmissibility, exposing the plasmids to a wider gene pool of host bacteria and providing opportunities for gene content diversification, which could potentially include AMR genes. Notably, the iuc3 plasmids carry an arsenal of additional virulence loci involved in iron metabolism and resistance to heavy metals, reminiscent of KpVP-1 (Fig. 2). The other novel plasmids appear to derive from outside K. pneumoniae (Fig. 1, Additional file 10). Most concerning are the four E. coli-derived plasmids we detected carrying iuc5 (and occasionally iro5) in the USA and Brazil, three of which were found in the MDR hospital outbreak-associated clone CG258. Whether these aerobactin plasmids harbour AMR genes as they do in E. coli is not currently resolvable; however, it seems that conjugative E. coli plasmids such as D3 plasmid A do have the potential to deliver hypervirulence and multidrug resistance to K. pneumoniae strains in a single step. A recent study of K. pneumoniae submitted to Public Health England used PCR to screen for isolates carrying both carbapenemase genes and rmpA, as a marker of the virulence plasmid, and identified a plasmid harbouring iuc, rmpA, rmpA2 and the AMR genes sul1, sul2, armA, dfrA5, mph(A) and aph(3′)-VIb . To our knowledge, this is the first report of a complete sequence of a K. pneumoniae plasmid harbouring both AMR and virulence genes. The isolate (ST147) was not included in our original screen; however, subsequent analysis using Kleborate plus manual inspection of the plasmid sequence reveals it carries iuc1 (AbST63, a novel single locus variant of AbST1 which is typical of hypervirulent clones CG23, CG65 and CG86) and appears to be a mosaic carrying sequences from KpVP-1 (40% coverage), an IncFII tra-trb conjugative transfer region and transposons carrying AMR genes. The presence of aerobactin synthesis loci in the iuc5+ K. pneumoniae isolates we identified here was not reported in the original studies [52, 53], and thus, it is not known whether they actually produce aerobactin or show enhanced virulence. This highlights the need to raise awareness of the iuc and iro loci as potentially clinically relevant hypervirulence factors and to screen for them in isolates and genome data. The latter, we aim to facilitate via the genotyping schemes established here, which can be used to easily screen new genome assemblies using Kleborate (https://github.com/katholt/Kleborate/) or BIGSdb-Kp (http://bigsdb.pasteur.fr/klebsiella/klebsiella.html), or new short-read data sets using SRST2 (https://github.com/katholt/srst2). PCR primers suitable for screening for iro and iuc can be found in Lee et al. . Notably, many studies rely on the hypermucoidy phenotype to identify hypervirulent strains; however, this is dependent on growth conditions , and recent studies indicate that aerobactin synthesis is a more important virulence determinant [13, 14, 16]. Our data suggest that hypermucoidy screening would typically pick up most of the common aerobactin plasmids KpVP-1, KpVP-2 and iuc2a+ plasmids, but not those carrying iuc3 or the iuc5 plasmids from E. coli. Additionally, it is important not to conflate the presence of the core chromosomal receptor gene iutA with the ability to synthesise aerobactin, which is encoded in the iuc locus . False-positive detection of the aerobactin locus version of iutA can be avoided by using an identity threshold of < 20% divergence. Tellurite resistance has also been suggested as a phenotypic screen to identify hypervirulent isolates of CG23, CG65 and CG86 ; our data confirm this is a good marker for KpVP-1 (92.6% carry ter) but not for other aerobactin plasmid types (Additional file 12). Our results illuminate that distinct virulence plasmid variants are associated with the various hypervirulent K. pneumoniae lineages but also highlight that these alongside other plasmids and MGEs can shuttle aerobactin and salmochelin synthesis loci to other lineages, threatening the emergence of novel hypervirulent strains. Indeed, reports of MDR clones acquiring iuc plasmids appear to be increasing in incidence, particularly in China [27, 29, 57–59] and have been associated with increased morbidity and mortality. The AbST and SmST typing schemes developed in this study provide an important resource to identify and monitor the movement of iro and iuc loci and associated MGEs in K. pneumoniae genomes; which will be important to detect and contain these emerging threats. Genotyping with our tools reveals the iuc plasmid identified in the recently reported fatal hospital outbreak of carbapenemase-producing ST11 in Beijing is a variant of KpVP-1 that carries iuc1 (AbST1) and a single copy of rmpA but lacks the iro locus . In this strain, the aerobactin plasmid does not carry any AMR determinants; the carbapenemase gene blaKPC and several other AMR genes were located on other plasmids. Concerningly, the ability for the virulence plasmids to be maintained in K. pneumoniae lineages suggests that once established in the MDR hospital outbreak-associated clones, they may become quite stable. The initial report of iuc+ KPC+ ST11 in China prompted multiple other groups to report the detection of the same strain in their hospitals [60–62], suggesting this strain may indeed be emerging as a persistently hypervirulent and MDR form of K. pneumoniae. 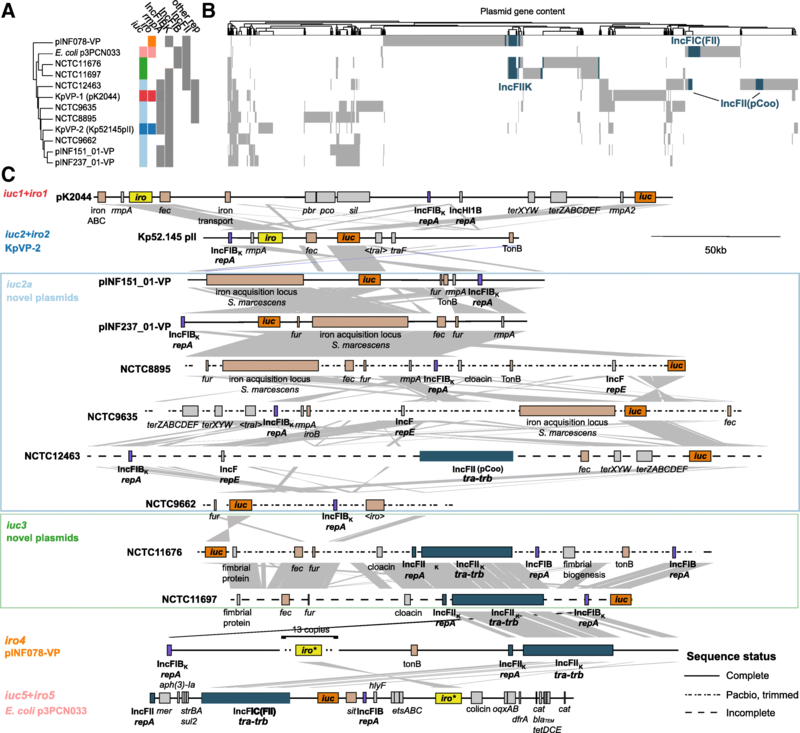 Genomic surveillance and control of the spread of such ‘dual-risk’ strains, or indeed even plasmids combining both characteristics of MDR and hypervirulence, clearly needs to be reinforced; the present work will bolster efforts to understand and limit the emergence of infections caused by K. pneumoniae strains carrying the high virulence determinants aerobactin and salmochelin. We thank the team of the curators of the Institut Pasteur MLST system (Paris, France) for importing novel alleles, profiles and/or isolates at http://bigsdb.pasteur.fr. This work was funded by the National Health and Medical Research Council (NHMRC) of Australia (project #1043822), a Senior Medical Research Fellowship from the Viertel Foundation of Australia and the Bill and Melinda Gates Foundation of Seattle, USA. All whole-genome sequences analysed in this study are publicly available in NCBI or the NCTC 3000 Project website (https://www.sanger.ac.uk/resources/downloads/bacteria/nctc/), accession numbers are listed in Additional file 1. Complete genome sequences generated for this study (summarised in Additional file 3) have been deposited in NCBI GenBank under accessions QWFT01000001-QWFT01000009, and CP032831-CP032838. Accession numbers for the 12 reference plasmid sequences are listed in Additional file 2; the set of annotated sequences and the Mauve multiple alignment of these sequences are also deposited in FigShare (doi: https://doi.org/10.6084/m9.figshare.6839981). The aerobactin and salmochelin MLST schemes are available in the K. pneumoniae BIGSdb database (http://bigsdb.pasteur.fr/klebsiella/klebsiella.html) and in the Kleborate distribution (https://github.com/katholt/Kleborate). MMCL performed the majority of data analyses and wrote the paper together with KEH. RRW, KLW, SB and KEH contributed additional data analysis, visualisation and interpretation. SB incorporated the novel MLST schemes into the BIGSdb. RRW and KEH wrote the code. AJ contributed clinical isolates, data and interpretations. LMJ performed the DNA extraction and nanopore sequencing. All authors edited and approved the final paper. Martin RM, Bachman MA. Colonization, infection, and the accessory genome of Klebsiella pneumoniae. Front Cell Infect Microbiol. 2018;8(4). https://doi.org/10.3389/fcimb.2018.00004. Runcharoen C, Moradigaravand D, Blane B, Paksanont S, Thammachote J, Anun S, et al. Whole genome sequencing reveals high-resolution epidemiological links between clinical and environmental Klebsiella pneumoniae. Genome Med. 2017;9(1):6. https://doi.org/10.1186/s13073-017-0397-1. Lam MMC, Wick RR, Wyres KL, Gorrie C, Judd LM, Jenney A, et al. Genetic diversity, mobilisation and spread of the yersiniabactin-encoding mobile element ICEKp in Klebsiella pneumoniae populations. Microb Genom. 2018;4(9). https://doi.org/10.1099/mgen.0.000196. Russo TA, Olson R, Fang C-T, Stoesser N, Miller M, Hutson A, et al. Identification of biomarkers for the differentiation of hypervirulent Klebsiella pneumoniae from classical K. pneumoniae. J Clin Microbiol. 2018. https://doi.org/10.1128/JCM.00776-18. Lam MM, Wyres KL, Duchêne S, Wick RR, Judd LM, Gan Y, et al. Population genomics of hypervirulent Klebsiella pneumoniae clonal-group 23 reveals early emergence and rapid global dissemination. Nat Comms. 2018. https://doi.org/10.1101/225359. Cheong HS, Chung DR, Lee C, Kim SH, Kang C, Peck KR. Emergence of serotype K1 Klebsiella pneumoniae ST23 strains co-producing the DHA-1 and an extended-spectrum beta-lactamase in Korea. Antimicrob Resist Infect Control. 2016. https://doi.org/10.1186/s13756-016-0151-2. Wyres KL, Wick RR, Gorrie C, Jenney A, Follador R, Thomson NR, et al. Identification of Klebsiella capsule synthesis loci from whole genome data. Microb Genom. 2016. https://doi.org/10.1099/mgen.0.000102. Wick RR, Heinz E, Holt KE, Wyres KL. Kaptive web: user-friendly capsule and lipopolysaccharide serotype prediction for Klebsiella genomes. J Clin Microbiol. 2018. https://doi.org/10.1128/JCM.00197-18. Liu C, Zheng H, Yang M, Xu Z, Wang X, Wei L, et al. Genome analysis and in vivo virulence of porcine extraintestinal pathogenic Escherichia coli strain PCN033. BMC Genomics. 2015. https://doi.org/10.1186/s12864-015-1890-9. Lee IR, Molton JS, Wyres KL, Gorrie C, Wong J, Hoh CH, et al. Differential host susceptibility and bacterial virulence factors driving Klebsiella liver abscess in an ethnically diverse population. Sci Rep. 2016. https://doi.org/10.1038/srep29316. Zhan L, Wang S, Guo Y, Jin Y, Duan J, Hao Z, et al. Outbreak by hypermucoviscous Klebsiella pneumoniae ST11 isolates with carbapenem resistance in a tertiary Hospital in China. Front Cell Infect Microbiol. 2017. https://doi.org/10.3389/fcimb.2017.00182.